A unique ID, which is used by Rocrail to address the element. This ID is usually assigned by Rocrail. This attribute stores the string, which should be displayed in the track plan and can be changed here. Select the path to an image using this button, to show an image instead of a simple text. Image refresh time in ms which can be used for WebCam pictures. This option must be greater the 99 to be activated. Is the field empty, the ID will shown as tooltip. Background color can only be set by using the Backgrond item in the Context menue. To get a transparent background (then the Track plan color will be shown) is necessary to set there the Background color to "black". You can change with this attribute the font size of the text. 0 (default) means the standard value of the operating system. The raster width and height of the text object. Default type for normal text. Pop up an text entry dialog, on left mouse click, to modify the text. Text values can be used as condition in actions. Render HTML instead of plain text. Use this in combination with a Location Timetable. Reset the saved text content at startup; Useful for dynamic text. Draws a border around the text field. In case the text points to an image it will be mirrored horizontally. If dynamic text starts with the new line char it will be appended to the existing text. If the text ends with .png the text object will try to find the matching image in the Imagepath. The image will be scaled, with respect to the image aspect, to fit the text size as defined on the Position Tab. 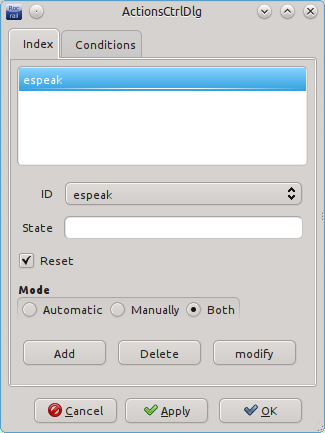 An action can be used to let the text be spoken by a program like espeak on the server. To have textfields updated by a block be spoken on the client, read Speak command. This action will only be executed when this text object is update by a Text action. (See Dynamic text). 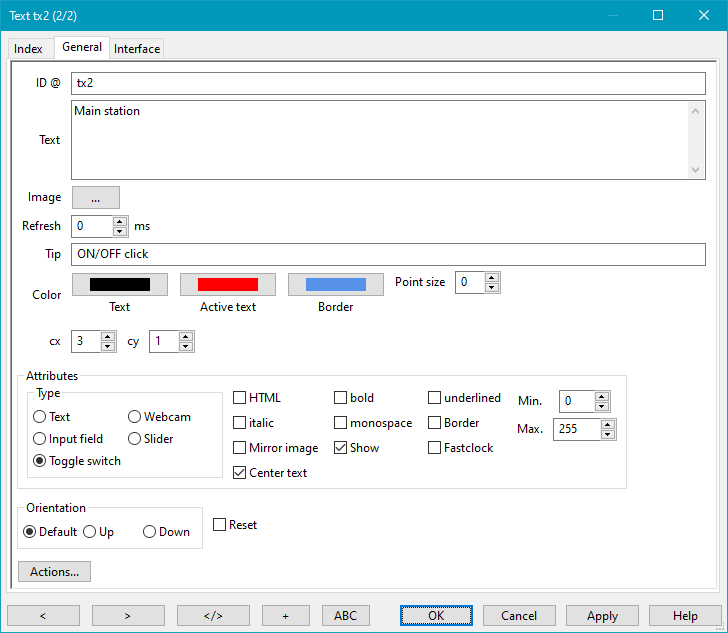 linked to this text object using the actioncontrol dialog like this. Dynamic text is text that is updated or changed through an action. 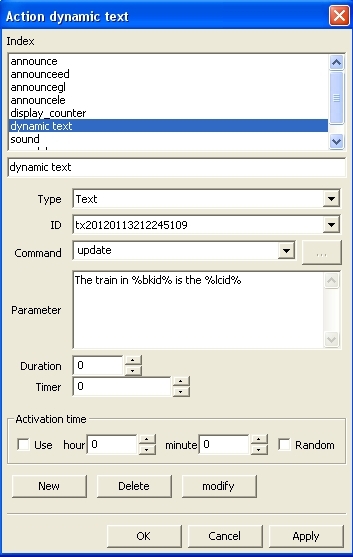 A text object needs to be created in the track plan to contain the dynamic text. It is not important what text is written in the field as this will be changed through the action that controls the text object and therefore can be left blank. It is important that the width of the text object (Cx in the Position tab) be wide enough to contain all the text that will be written here by the action. Also make a note of the ID of the text object. This will be needed when the action that will change the text will be defined. From the Tables menu, choose the Actions table and create a new action by clicking on New. In the field Type choose Text, in the field ID choose the ID of the text object you have just created above and in the Command field choose Update (it is the only option). The Parameter field will contain the text that will appear in the associated text object. E.g. The train in %bkid% is the %lcid%. The text between the % are the variables that will be updated every time the action is carried out. %sec% Model seconds part of time: Only available if Action timer 60sec is disabled. %syssec% System seconds part of time: Only available if Action timer 60sec is disabled. %callerid% The ID of the object which called this action. %callertype% The type of the object which called this action. %callerdesc% The description of the object which called this action. %calleruserdata% The user data of the object which called this action. %state% The state of the calling object. %substate% The sub state of the calling object. %desc% The Description of the calling object. %lcengine% Loco engine: "diesel", "electric", "steam", "automobile"
%waybill% The waybill ID assigned to this car. %waybilldest% The destination of the assigned waybill to this car. %bidicode% Loco or car code scanned by a sensor. %bidicode2id% Loco or car ID which match the scanned code by a sensor. 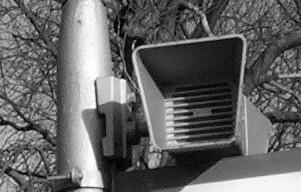 %bidicode2img% Loco or car code scanned by a sensor. If a loco or car is found with this code the image name, if set, will replace the code text. %counter% Number of state ON events. @txtID The text value of a text object. @varID The text value of a variable. @@nvarID The indexed, n=0…9, text value of a variable. The text value must be a comma separated list. ##nvarID The indexed, n=0…9, text value of a variable converted in an integer. (atoi) The text value must be a comma separated list. ~varID A pointer to the variable text or value; Depends from XMLScript command: value="~varID" or text="~varID"
The next step is to choose the object that will be associated with the action. 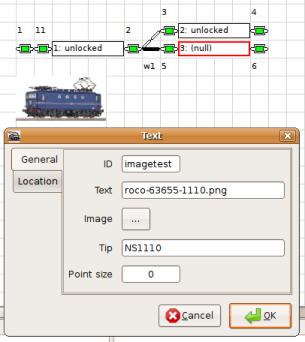 In the example above it would be the block for which the dynamic text will be updating with the loco ID. Therefore if the block that is being associated with the action is block LP1 and the next train to enter the block is 3MT, the text object would read "The train in LP1 is the 3MT". Following the example the Properties of block LP1 are chosen. In the Actions submenu the action that changes the dynamic text is chosen from the list in the ID field. The State field should read enter so that the action is initiated when a train enters the block. Use the speakcommand –> this will be executed on the client computer. Configure an extra action as shown here –> this will be executed on the server computer. will play a jingle before the dynamic text is spoken. Just put the code in a .bat file, like sound.bat. Just call that .bat file from an action connected with a text object in Rocrail. 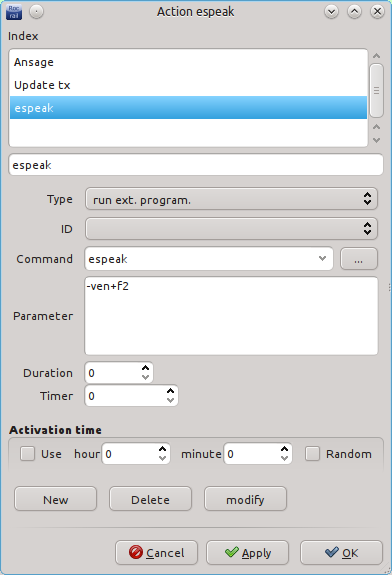 The examples of commands in scripts or batch files with sounds and "espeak" can also be used individually. If only a single command line should be done, it can be even without a script or batch file entered directly in the command field of the action. The Microsoft Speech Platform offers better quality voices in various languages including English, German, Dutch and Italian. 1. Download and install the Speech Platform Runtime http://www.microsoft.com/download/en/details.aspx?id=27225 (the file 'x86_SpeechPlatformRuntime\SpeechPlatformRuntime.msi'). 2. Download and install Runtime Languages for use with the Speech Platform http://www.microsoft.com/download/en/details.aspx?id=27224 (files with names starting with 'MSSpeech_TTS_'). Choose the tab Microsoft Speech Platform and you will find the language you have downloaded. Closing the program now and this set this voice as your default. Balabolka can be run in command line mode too. With the above parameters Balabolka reads your dynamic text in a minimized form and then quits after the text is read. It is important that for this to work, the Action that calls up the batch file comes from the cell that contains the dynamic text. Other voices such as those produced by AT&T can be bought if you wish even more better sounding voices.